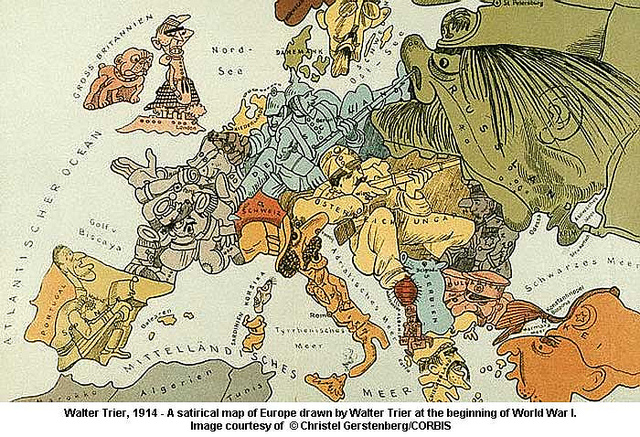 Political cartoon by Walter Trier (1890-1951). Today marks the hundredth anniversary of two major events in the First World War, Germany’s invasion of neutral Belgium to gain strategic access to France, and Britain’s declaration of war with Germany. France was allied with Russia in 1914 through the Franco-Russian Alliance of 1892. Germany had declared war with Russia on August 1, 1914, to retaliate against Russia’s military organization and its allegiance with Serbia, which was in conflict with Austro-Hungary, Germany’s ally as part of the Triple Alliance of 1882 between Austro-Hungary, Germany, and Italy. The conflict began with the assassination of Franz Ferdinand, heir to the Austro-Hungarian Throne, on July 28, 1914 in Sarajevo. The assassin, Gavrilo Princip, was one of six Slavic nationalists whose plot was intended to cut ties between Austro-Hungary and Serbia in order to create Yugoslavia as an independent, pan-Slavic state incorporating Bosnia, Croatia, Serbia, and other south-Slavic regions. As the conflict escalated from a reactionary political crisis to a military conflict between powerful alliances, other nations entered the war, including Bulgaria, Italy, Japan, the Ottoman Empire, and the United States. An estimated 9 million people died in the First World War. It brought to light outdated imperial agendas and alliances, introduced horrendous new military technologies including the tank and chemical weapons, and put on hiatus intellectual movements pushing for women’s rights, minority rights, and worker’s rights. Multiple nations are responsible for atrocities, including the German treatment of Belgian civilians and the Ottoman implementation of the Armenian Genocide. Empires collapsed during the war. Irish and Russian political revolutionaries took up arms during the war, partially motivated by the appalling death toll by 1916 and 1917. As a result of subsequent events, England partitioned Ireland, the USSR replaced the Russian Empire, and the Ottoman empire dissolved along with the centuries-old Caliphate. In a desperate effort to prevent another such war, the League of Nations was formed. So too was the Treaty of Versailles, which placed astronomical debt on Germany and fueled radical parties left and right. The aftermath of the War led to numerous other conflicts: civil wars, partitions, decolonization, and the Second World War. As a result of World War Two, superpower nations entered the Cold War, accompanied by the Space Race, Arms Race, nuclear proliferation, and military intervention in Latin America, Asia, Africa, and the Arab World. The War influenced Modernism and ultimately obliterated popular perceptions of war as romantic. It changed art, literature, music, popular culture, and even cinema with the adaptation of Erich Remarque’s All Quiet on the Western Front. 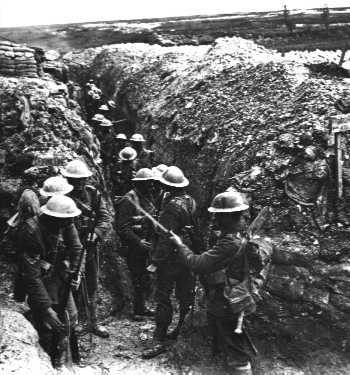 The First World War was a humanitarian calamity; almost all conflicts today can be traced to the War. The exact causes are still contested. Some point to imperial allegiances; others point to an interest, especially by Britain, to suppress political activism from suffragists and socialists. Others point to a moment of panic among imperial leaders. Regardless of the causes, it repeatedly defined and redefined the twentieth century. Today, as Russia enters Ukraine, as Israel assaults Gaza, as complex networks of allegiances overlap and the U.S. flails when asked about whom it considers its allies, the conditions for a world conflict are strikingly similar. The Great War mutilated the twentieth century, but it is not yet clear if it will do the same to the twenty-first. If political leaders panic in a moment of crisis and declare war within a month, world conflict may continue. Alternatively, we could all take a moment and consider the dangers of reactionary retaliation and ask ourselves if we want another century of war and genocide, if we want to see 9 million more dead for a war that can so easily be avoided. I hope that commemorations such as this one in London will motivate nations to pause before considering military action. One day, I hope military action will no longer be perceived as an easy option, because for the victims and survivors, there’s nothing easy about it. This entry was posted in History, Writing and tagged Belgium, Britain, Commemoration, Conflict, First World War, France, Gaza, Germany, Great War, Historiography, History, Israel, Russia, Ukraine, War to End All Wars, Western Front, Wolrd War Three, World War One, WW I, WW II on August 4, 2014 by keeneshort.